Pho is addicting, but it's a healthy addiction. 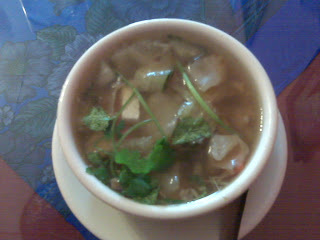 Pho fusion is one of my regular stops for lunch. 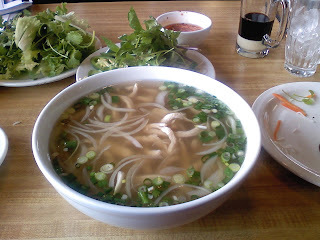 Pho is the Vietnamies soup that is becoming very popular accross the nation. Had a great lunch today with Erin Seabold, founder of The Seed, at Augustine Grill in Castle Rock. The restaurant is set in an old Victorian home. The atmosphere, service and food were excellent. 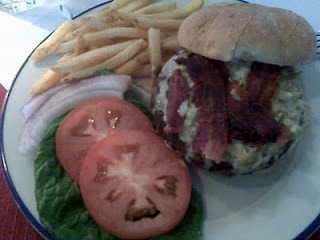 I didn't have anything fancy, just a really good hamburger that was well-seasoned, topped with blue cheese, bacon and green chilis. If I weren't trying to lose weight, I might of had two! The fries were delicious as well. They had just the right amount of salt and were cooked perfectly. Not something I find everywhere, that's for sure. I'll definitely be back. I hear they're famous for their quiche. 1. We will have a hell of a good time. 2. The food will be good (and it varies greatly...which is fun!). 3. The wine/drinks will be good. 4. We can't wait for the next one. So this dinner was at Bob and Deb's place downtown. ALL of the food was delicious. Below are some pics of the spread she prepared for us. Shannon will need to fill in the blanks with the wine and whatever else I missed. Thanks for a great time!! 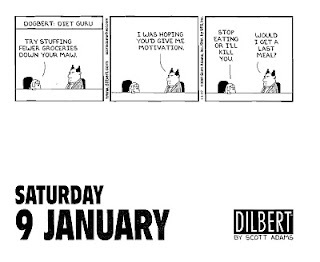 Grub-a-dub-dub. Incredibly smooth Jose - thanks Bob! The bird is the word!!! I love quaint neighborhood businesses that have survived the “Big Guys”, you get treated like family and they love to share everything they know about their craft! Ok….so let’s talk about the “Bird”….Chicken, Turkey, Duck, Dove, Pheasant and the likes….nobody does it better than Wheat Ridge Poultry and Meats! I have been frequenting this cool market for years and years. On a trip to the countryside of Loire Valley a few years ago…I lived my dream…we rented a French Farmhouse in a village, I got to shop the local markets everyday, come home to cook, drink wine and eat fabulous meals in our beautiful courtyard. The chicken was the REAL thing there. Fresh chicken, vineyard white wine, wild mushrooms, fresh cream and fresh herbs…need I say more? Didn’t taste even remotely close to our bland bird here, except for the poultry at Wheat Ridge Poultry and Meats… darn close there! Truly folks, try this little piece of heaven…in addition to Poultry, they have a great selection of meats, farm fresh eggs, homemade pies, seasoning mixes, fresh milk and much, much more. Order your Thanksgiving Turkey there…you will have to wait in line but worth every second! With all due respect….forget about the Whole Foods and Tony’s experience and check out the quality, price and then look at the smiles across the table! They also have their own Meat Processing Plant for Wild Game. (Close to the Highlands) Grub on! 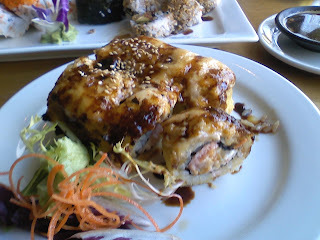 Had a great meal for my sister on Friday. 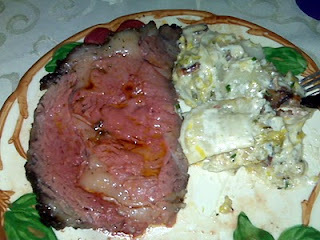 Manuel cooked a beautiful Prime Rib Roast. His method was different, but it worked great. 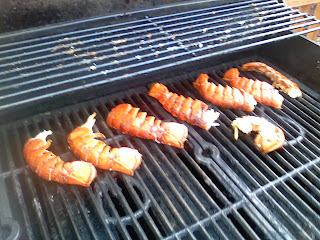 High heat (~500) for 45-60 minutes, then turn it off and leave for 2 hours. Do not open the oven during this time. The roast will continue to cook and be medium to medium-rare. Don't forget the rest time after you take it out of the oven. 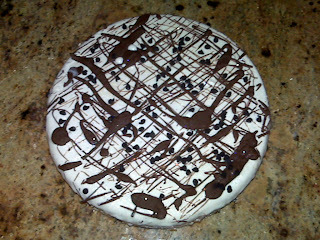 The crust on it was sooooo good. My brother, Grant, made Tyler Florence's Ultimate Potatoes Au Gratin. It was ridiculously good. 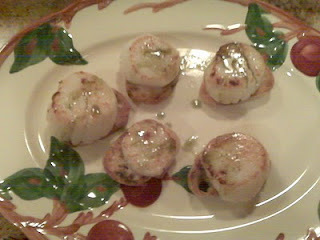 I made an appetizer...baguette, seared scallop, basil oil and kosher salt. My wife made an awesome ice cream cake. Thanks everyone! Happy Birthday, Maren! After cooking LOTS of steaks in my life and having plenty of bad ones at restaurants (ok, some good ones too), I wanted to share the proper way to cook a steak. 2. Seasoning. You can marinate a steak or use all kinds of seasonings, but I prefer the KISS principle...Keep It Simple Stupid! I rub olive oil all over the steak and then sprinkle generously with fresh ground pepper and French Grey Sea Salt. I use coarse Kosher salt in just about everything, but I really like the Grey salt on steaks. 3. Rest #1. Ideally, you want to season your steaks and then leave them on the counter 30-60 minutes before you cook them. Getting them to room temperature helps the steak cook more evenly and quickly. 4. High heat is essential. This is the mistake that most cooks (home or "professional") make. Using high heat to cook a steak will create a nice crust on the outside and lock in the juices, creating a beautiful and delicious contrast. I hardly every order a steak in a restaurant anymore, unless it's a Prime steakhouse like Del Frisco's, because most people don't understand this. 5. Where to cook it. I prefer a grill over a skillet, but both work well. The flavor on a skillet steak will definitely be different than on a grilled steak, but hey, work with what you have. 6. Cooking time. Every grill is different, so it will take a few times to dial in the right combination of time and heat for your particular grill. 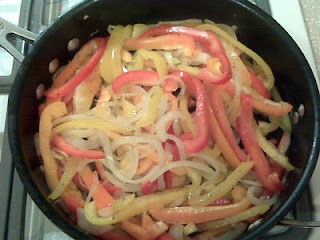 For a "normal" cut (not 2" thick), I like cooking mine about 3 minutes, then rotating it 90 degrees. This will give it nice grill marks and also create more crust (because more area is touching the hot grates). After a total of 6 minutes, flip over and repeat for another 6 minutes. For me, this results in a medium (pink center) steak. 7. Rest #2. 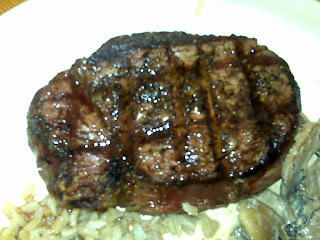 After cooking, leave on a plate or platter for 3-5 minutes (longer for really thick cuts), lightly tented with foil. The steak will continue to cook during this step so you want to take it off the grill a couple minutes BEFORE it reaches your desired temperature. This step is essential because it allows all the juices to stay in the meat, resulting in a juicier steak. If you didn't do this, the juices would run all over your plate and your steak would be dry. 8. Grub on. I think you know what to do in this step! 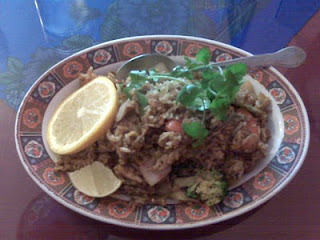 Had lunch today at Taste of Thailand. It's right across from Swedish Hospital. I first ate here last year with my good friend Donna. I love the quiet, calm atmosphere. The people are really nice and the food is delicious. I had the vegetable soup (really clean taste, mildly spicy, not bad) and the Kow Pad Kra Prow, which is a typical Thai street dish with fried rice, basil, garlic, onion, chiles, broccoli, cabbage and carrots. I added chicken to mine. It felt like comfort food to me, well-seasoned and mildly spicy. I said "mmmmmmm" alot (to myself, since I was eating alone). We're working on the slideshow headers on our blog. Hang tight while we figure it out. 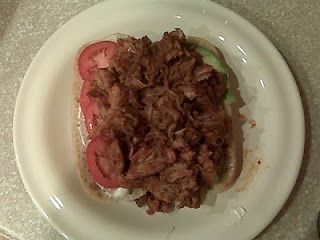 Sunday's dinner...Carnitas sandwich with Larimer Hot House BBQ Sauce, tomatoes, mayo and avocado. YUM! 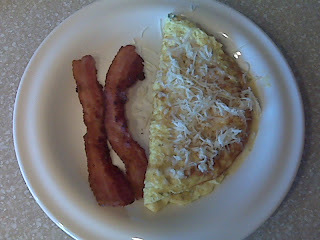 Sunday's breakfast...Omelet with dried epazote and mexican cheese, bacon. Made a Vegetarian White Bean Chili tonight from the New England Soup Factory Cookbook. 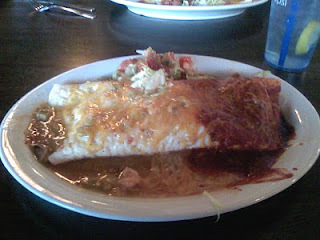 It was really good, but I'm a meat guy and would have liked some chicken or carnitas in there. 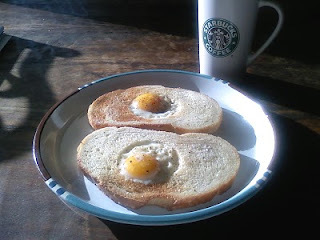 Even better would have been some crusty bread to soak up the good stuff at the bottom of the bowl. Oh well, it was healthy and tasted good. Not a bad combination. 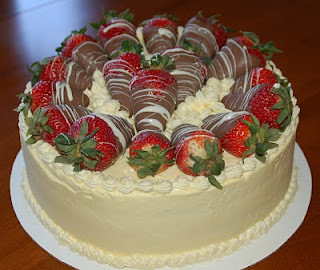 How good does this look?!?! 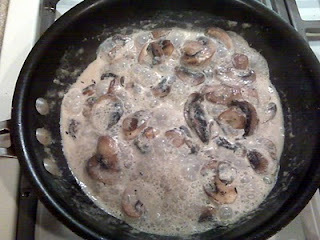 On January 1st, made some grilled new york strips, mashed potatoes and sauteed mushrooms in cream sauce. 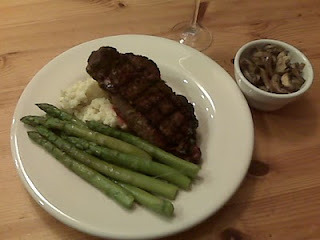 Yes, I overcooked the asparagus. 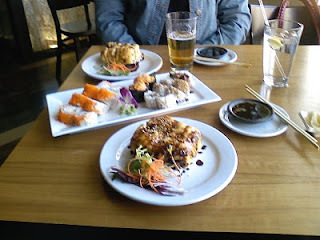 Everything else was deeeeeeelicious. For Christmas Day I made chorizo and roasted poblano queso. I wasn't sure how much of a hit it would be since my inlaws don't like spicy food, but I barely got any 'cuz they ate it all up so fast! I made at least 10 more of those quesadillas I mentioned below. I couldn't get enough of the carnitas and good mexican cheese. Thanks to Shannon for hounding me to buy the Costco carnitas. It's so easy and delicious. Croque-monsieur - YUM! Basically a kicked-up ham and cheese. I've wanted to make these forever. Thank goodness I did. I made chocolate truffles (Grand Marnier, Kahlua, plain, toasted coconut, raspberry) and quesadillas with carnitas and roasted poblano peppers. My brother, a huge Bobby Flay fan (for good reason...everything he's made is really good), made Mini Open-Faced Steak Sandwiches on Garlic Bread with Aged Provolone, Caramelized Onions and Parsley Oil. They were ridiculous! My sister made ceviche for the first time and it turned out great. So did everything else. Thanks, guys!